In the sunshine this afternoon, the interiors of Marian Goodman Gallery in Golden Square were really quite breathtaking. The flawlessly white walls, and beyond-pale, lime waxed white wood floors set up a kind of quivering, pallid preciousness that inspired church-like silence. Architectural surfaces so pristine and totally devoid of blemish, interiors so exquisitely disposed that the experience of walking through them was akin to the virtual. In this setting is Nairy Baghramian’s first show with the gallery and her first appearance in London since her collaboration with Phyllida Barlow at the Serpentine in 2010. An Iranian-Armenian, Baghramian is based in Berlin and has established a very distinguished exhibiting history in the last ten years. Back in 2009 she showed at Studio Voltaire, with an exhibition called Butcher, Barber, Angler & Others. It staked a territory for her work between the real-world use value of the tools of different trades and the conceptual and formal autonomy of the artwork. 2008 and 2010 were marked with important exhibitions in collaboration with older, female practitioners. 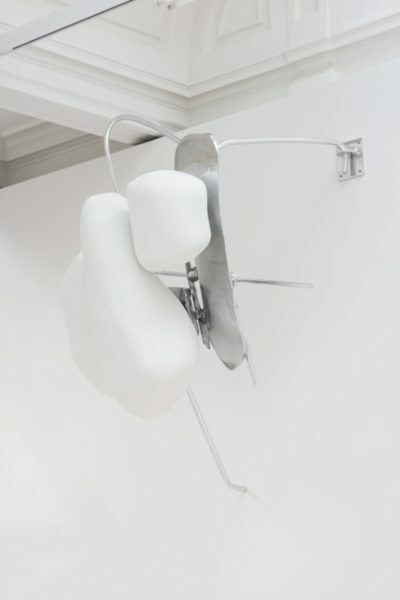 In 2008 Baghramian collaborated with pioneering designer Janette Laverrière for a Schinkel Pavillon exhibition during the Berlin Biennial; at the Serpentine Gallery in 2010 Baghramian was paired with Phyllida Barlow, the sculptor who will represent Britain in Venice next year. Last year’s Venice Biennale showcased Baghramian’s close friendship with Danh Vō, in the exhibition Slip of the Tongue that he curated at François Pinault’s Punta della Dogana gallery. 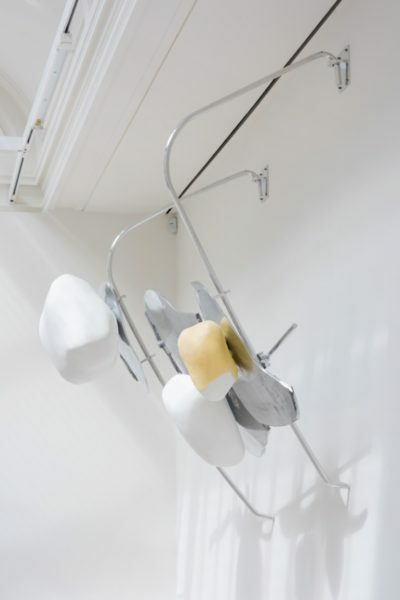 Displaying a similar enjoyment of idiomatic English, the current show, Scruff of the Neck, imagines the two floors of the gallery as the interior of a human head. 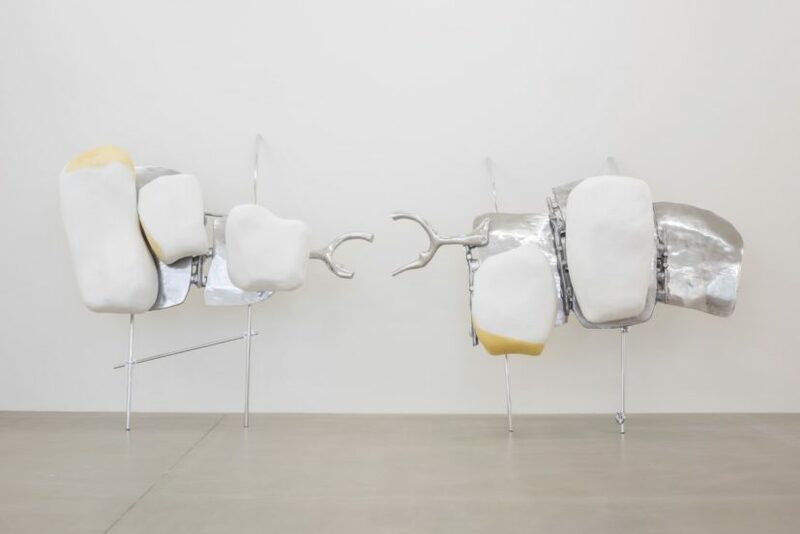 The sculptures are all titled Scruff of the Neck, and are differentiated by designations from dentistry: LL 23/24 & LR 26/27/28 – presumably ‘lower left’ and ‘lower right’. Anyone who has paid handsomely for orthodontic treatment will grudgingly attest to the way tailor-made tooth-training devices can resemble miniature sculptures. Baghramian’s work co-opts some of these forms, but scaled as if the skull were the size of the gallery spaces. 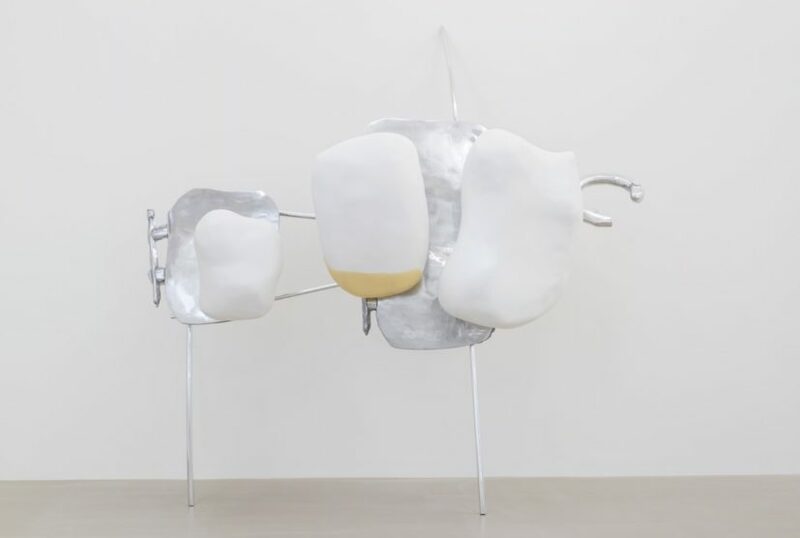 Her materials – cast and polished aluminium, polished aluminium rods, plaster, beeswax and rubber – have the sheen and monochrome palette of minimalist sculpture, but the references to the body are inescapable. Rendered weird by their Brobdingnagian translation from micro to macro, the objects are abstracted from their original meaning, but not so totally as to free the viewer from a flickering between their seductive formal presence and a slightly cringing memory of their real-world associations. 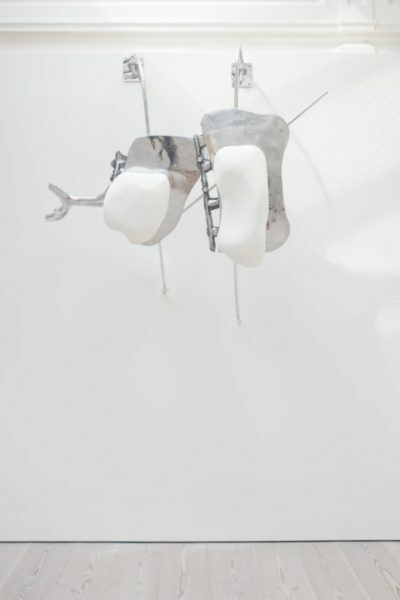 Work in last year’s show in Venice, as well as at the New York SculptureCenter in 2013 where her show was titled Retainer, displayed similar borrowing from the ‘vocabulary’ of orthodontics. Unlike the current show where each work either leans against the wall, on the ground floor, or is mounted high on the wall upstairs, the earlier pieces were freestanding. 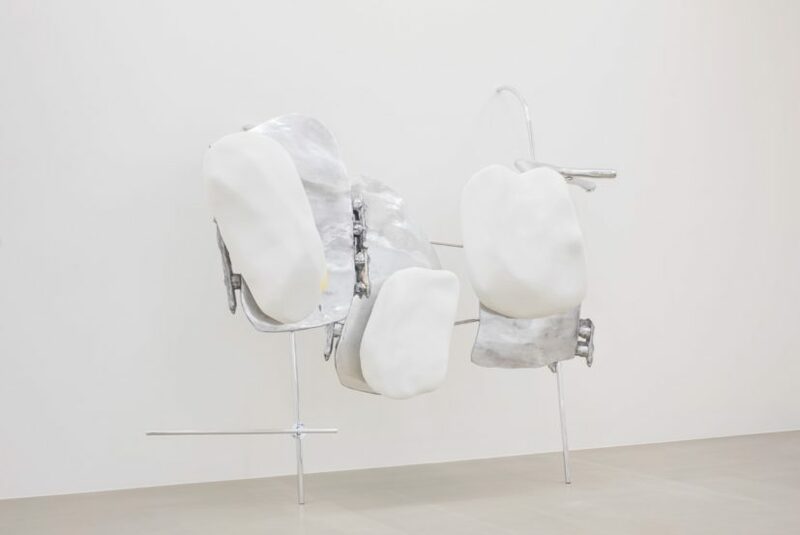 Occupying the centre of the gallery on slender steel armatures, the flesh-coloured, semi-translucent panels mimic the bespoke prosthetic devices designed to perfect our bodies and mould our physical fallibility to some notion of the socially, aesthetically acceptable. 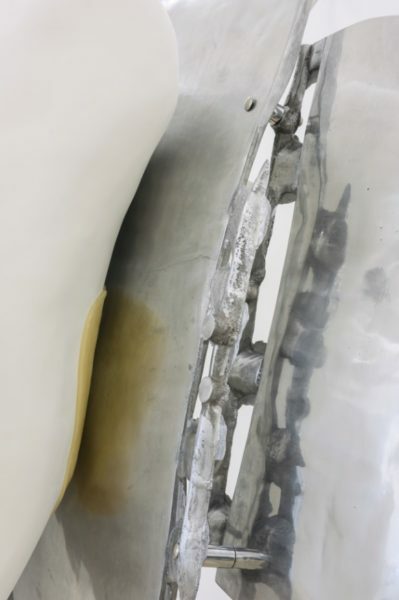 As with the work in the current show, these sculptures with their combination of the biomorphic and the mechanical are allusively potent objects. 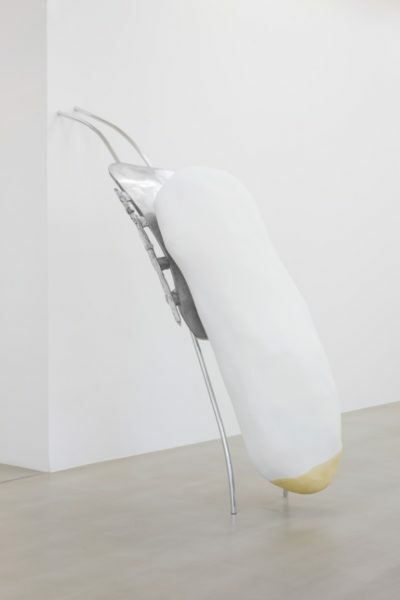 Baghramian engages with the legacy of sculptors from previous generations, such as Claes Oldenburg for example, while absolutely taking territory that is all her own. She has just been announced as the winner of the 2016 Zurich Art Prize and will be a major presence at next year’s Documenta 14 and Skulptur Projekte Münster, where we may see more reflection of the political dimension of her thinking. For now, get along and take advantage of the chance to see this substantial show of new work that is particularly interesting in relation to positions taken by artists working here such as Helen Marten and Magali Reus.